When you automate a repeated operation in your business, you need to have visibility over the performance of those operations. This is especially important if the service we are talking about is something as crucial as Backup and Disaster Recovery. In fact, any software or SaaS product you may use will have 10% of its functionalities set aside to build in Monitoring options. Being able to know whether the backup is successful is as important as the backup job itself. Vembu BDR Suite is no exception. By setting your backup server with BDR Backup Server, you can configure backups and perform recovery of your backup data. Apart from that, you get extensive visibility into the performance of the backup jobs and the various parameters you look into. Reports like Backup Status allow you to see the success of the backup jobs performed in the last 24 hours or find the status of the latest backup job performed. Even then, when the number of backup jobs that are running in your infrastructure becomes too many to handle, you can schedule emails of the reports you want to see, at the time and day you want. You can see only the Missed or the Suspended or the Failed backup jobs to your inbox so that your inbox is not clogged with emails of every backup job every time they run. Verifying your backups regularly and enforcing the required corrective measures also comes under monitoring. 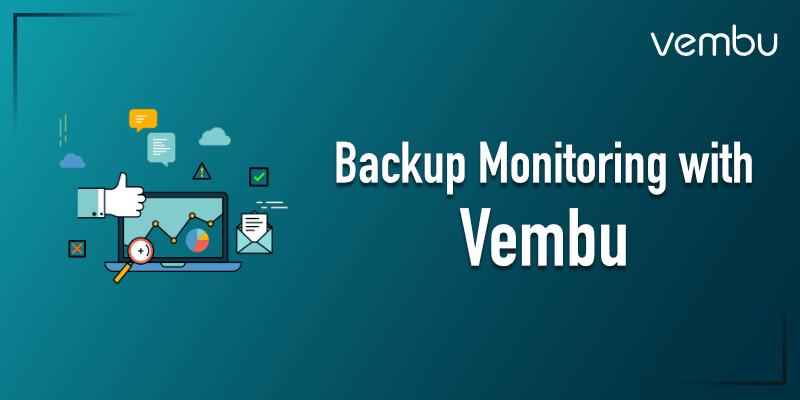 Vembu BDR verifies the recoverability of your backup data through a series of tests – Mount test, Boot test and Integrity test. 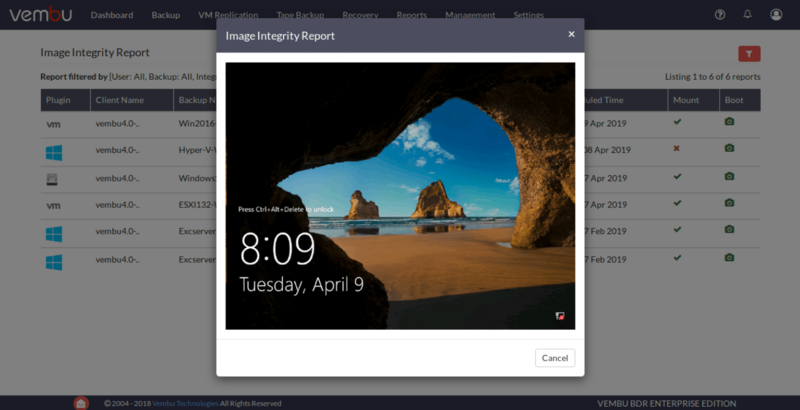 The backed up machine is started as a new VM and a screenshot of the booted VM is taken and emailed to you every day (the frequency can be changed). 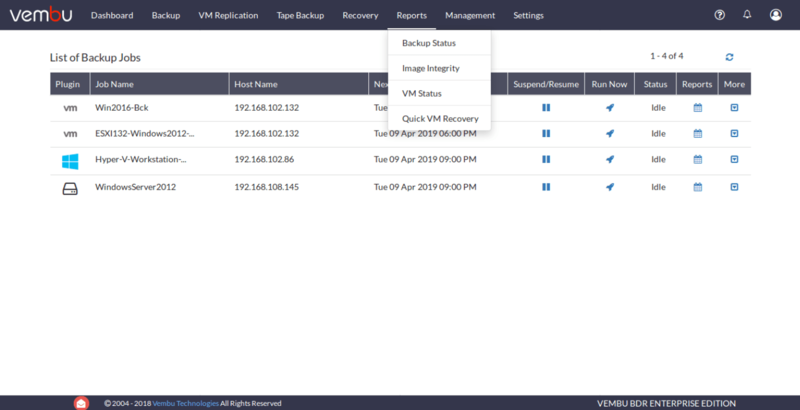 If something goes wrong in your backups and all you see is a Black screen where your booted VM should be, then you can quickly find the problem, resolve it and run backups again. 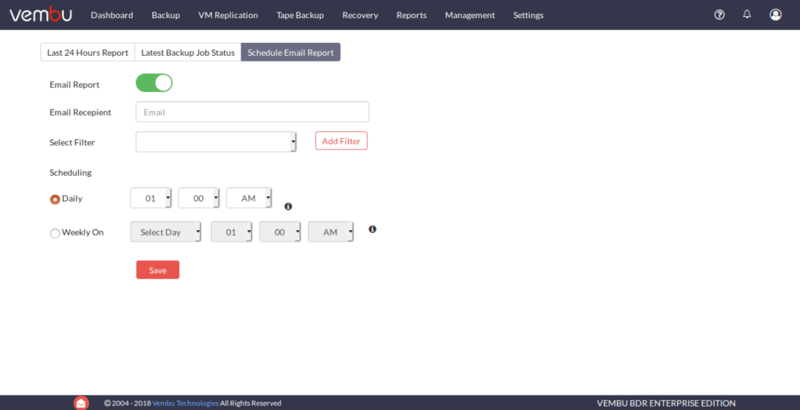 You can see the reports of the Quick VM Recovery option, where your backed up machine is instantly restored in a few minutes to avoid downtime. All these reports are available in the backup server console. But your infrastructure may be too large for a single backup server. Maybe you’ve implemented multiple backup servers or clustered a few backup servers for high availability. In that case, there is a simpler option to identify the status and performance backup jobs than logging into each backup server. This is the centralized monitoring console you can log into and view all reports of all the backup jobs running on all the backup servers. Giving you a simple dashboard showing the number of backup jobs that are successful, failed and in warning, you get the big picture of whether you are disaster-ready. Also, checking reports for each backup job by logging into each server can lead to needless resource-consumption and severe mental exhaustion. 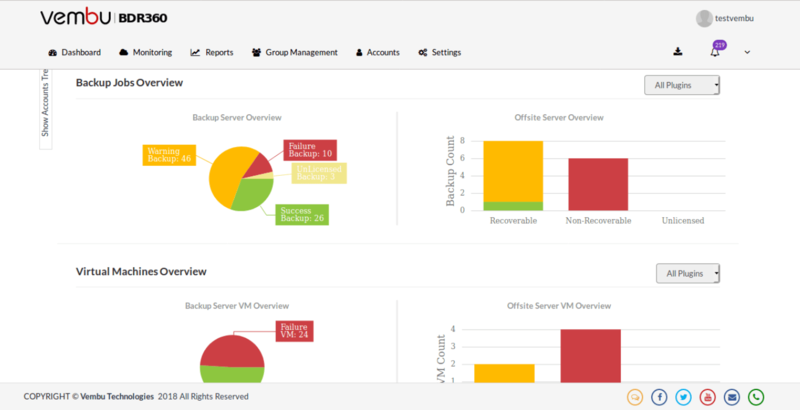 Every report available in the backup server is available in BDR360 making your monitoring simpler. Centralized monitoring becomes more important as your backup server deployment becomes more distributed. Try Vembu BDR Suite for a 30-day free trial.